MB took the tram into town on Saturday for some shopping therapy which included Haigh's and Adelaide Booksellers, an excellent second hand bookshop. 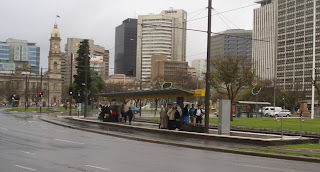 Above is a photo of the Victoria Square tramstop, with commuters huddling under the shelter out of the freezing wind and rain. This is the stop closest to the Adelaide Central Markets where MB stocked up on some fresh provisions. By the time MB got home her volleys and jeans were pretty much soaked. MDR's Helly Hansen spray jacket has turned out to be wonderful, kept her warm and mostly dry. The weather is still a novelty for MB, so no complaints whatsoever will be voiced here!